Physical activity is vital for good health. It has an established strong evidence base for its positive effects on functional capacity, reducing the risk of many chronic diseases, and promoting physical, mental and social well-being. Furthermore, these benefits are evident across a diversity of ages, groups and populations. The need for these benefits in current societies means that exercise practitioners, professional bodies, institutions, health authorities and governments require high quality evidence to establish appropriate exercise guidelines, implementation strategies and effective exercise prescription at individual, group and population levels. Research Methods in Physical Activity and Health is the first book to comprehensively present the issues associated with physical activity and health research and outline methods available along with considerations of the issues associated with these methods and working with particular groups. Working with children, older people, indigenous groups, LGBTI groups, and those with physical and mental health issues. 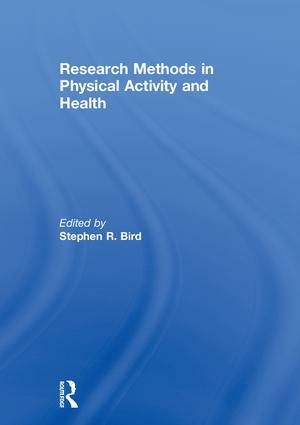 Research Methods in Physical Activity and Health is the only book to approach the full range of physical activity research methods from a health perspective. It is essential reading for any undergraduate student conducting a research project or taking applied research modules in physical activity and health, graduate students of epidemiology, public health, exercise psychology or exercise physiology with a physical activity and health focus, or practicing researchers in the area. 1. Why Research into Health and Physical Activity? 31. Translating Research Findings into Community Interventions. Considerations for Design and Implementation: A Case Based Approach. Stephen R. Bird is a Research Group Leader at RMIT University, Australia. He has over 30 years of experience working in the University and Hospital sectors in the field of Health and Exercise. He has authored five books in the field, as well as numerous book chapters and over 100 articles on the subject. He is an active member of numerous professional associations, including being a former Chair of the Physiology Section of the British Association of Sport and Exercise Sciences. His current research interests include physical activity for older people, the prevention of chronic diseases, and the use of exercise in rehabilitation programs.